Home / News and Updates / social / Social Media / Americans are getting lazy by Google. Americans are getting lazy by Google. Americans are using computer do to all task in day to day life. America is one of the country which is very sound at technology. Technology is required to do certain task but survey show that "Americans are getting lazy by Google.com" . It doesn't mean that only Americans getting lazy Google created own world on computer and they are controlling the internet user. Google tracking all your searches on Google. Google trying to know behavior of user virtually. Google know more about your thought then any person in your life. 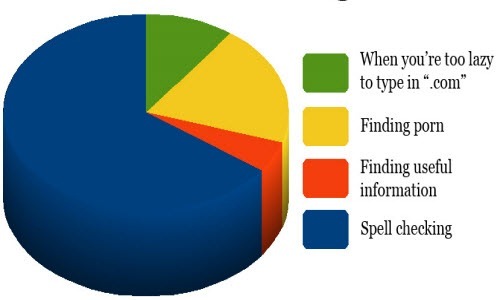 "Major factor that making people lazy"
User getting more lazy to remember spellings. Google provide an easy way so you don't need to write correct spell. Google will provide correct spell and you have one more factor of being lazy. Now Google started google voice so user don't even need to type. This is currently available on www.google.com . Go to Google.com you'll find speaker button on search bar. Click on it and speak that you want to search. Google made image search much easy. If you have picture of some place, thing, etc... and you want to know which is this place or thing. All you need is upload your image on google image search google will find the similar image of that uploaded image and now you can find thing based on images. This is a milestone in technology by google but they are making human lazy day by day.